Cinnamon is magical. It should be included in your diet because of all its health benefits, right? Some say cinnamon may cut your risk of heart disease. Other research will tempt you with cinnamon’s high quantity of antioxidants. I say just enjoy the flavor of this spice and the way it adds a layer of sweetness without adding sugar. For me, cinnamon conjures sweet and savory memories, from warm Indian dishes created in our cozy kitchens around the world to sweet baked creations with hot cups of tea on cold days. 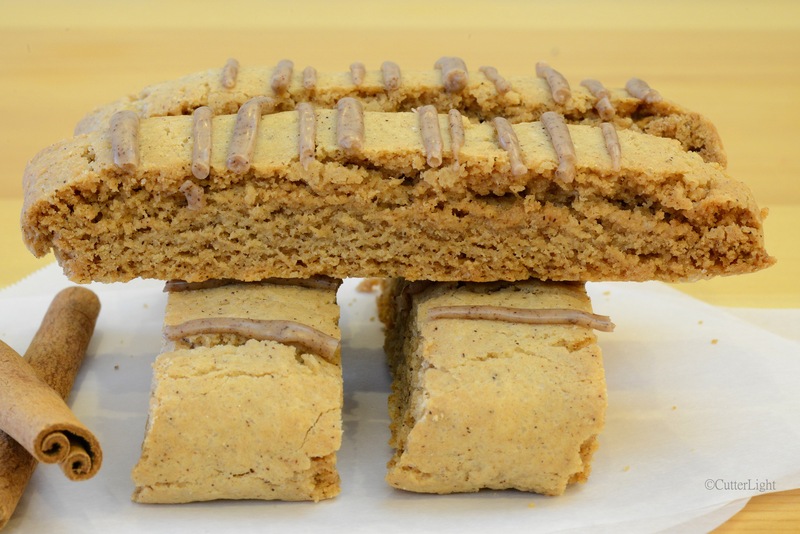 The latter memory inspired today’s cookie creation – double cinnamon biscotti. I generally lean toward soft cookies. Biscotti are the crunchy exception. Paired with a hot beverage, the speckles of cinnamon in the cookie and the sweet stripes of cinnamon icing atop the biscotti make for a winning combination. Preheat oven to 325 degrees F (165 degrees C). Line a baking sheet with parchment paper. Set aside. Sift together flour, cinnamon, baking powder and salt in medium bowl. In a large bowl, stir together butter and sugar. Thoroughly mix in flour mixture into egg mixture, half at a time. Shape 1/2 of dough into a long log on baking sheet, about 1 1/2 inches wide and about 9 inches long. Repeat with other 1/2 of dough. Give logs space in between because dough will spread during baking. Bake biscotti for about 15 minutes. Remove from oven and cool for about 15 minutes. Cut logs into 1/2 slices with a serrated knife. Place sliced cookies back on baking sheet and bake for 15 additional minutes. Flip cookies to opposite side and bake for 15 additional minutes. Make drizzle by mixing confectioners’ sugar, cinnamon and milk. Place drizzle in a zip top bag and snip off a tiny piece of bottom corner. Squeeze drizzle over cooled biscotti. Let drizzle set before serving. Store leftover cookies in airtight container. Cinnamon definitely makes it into my top ten spice list – love it. Biscuits have an amazing taste and so easy to make! Glad to hear you enjoyed them. Thanks for reading and commenting! You’re right about the cinnamon. I watched the rolls being cut and made last year while on a trip to Sri Lanka. Skill and great patience required, but how well worthwhile the result. Wow that must have been a cool process to watch. And it must have smelled wonderful. Hope you got to take some home. Your cinnamon biscotti sound great…one of my favorite spices. My husband always makes biscotti at Christmas time. These sound wonderful, as we all love cinnamon.